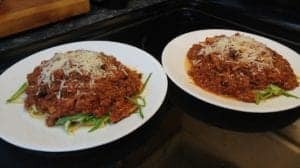 On a cool, rainy day, there is nothing quite as comforting as Spaghetti and Bolognese Sauce, but who wants all those carbs? 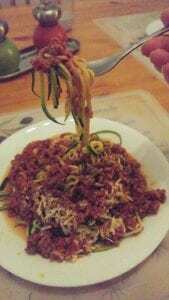 So I invented “Zoodles”; “noodles” made from zucchini. Well, I don’t think I exactly ‘invented them’ because I have since seen other people post articles about them, but they were innovative at the time. Now that I’ve made these a few times, I actually prefer them to wheat-based noodles, because you can eat a large plateful and not feel overstuffed afterwards. And when cooked just right, they actually can be wound up on a fork, just like pasta! 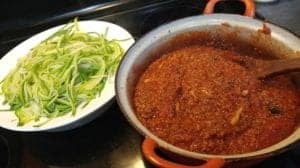 So how do I prepare Zoodles? 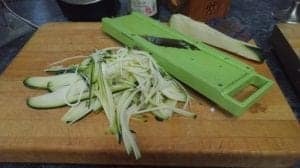 For two large servings, I take 2 or 3 slender, firm zucchini (less seeds this way) and shred them on a Japanese mandolin*, using the middle thickness of cross blade. * I use the Benriner mandolin, but one of those "spiralizers" would work too, except it would be difficult to avoid shredding the pulpy middle. I place the pile of raw “Zoodles” on a plate, sprinkle about 1 tsp. of water on top and cover with a microwave cover. Then I microwave them at 80% power for 3 minutes, then let stand for 3 minutes. I drain the excess water by placing the cooked Zoodles in a colander and leave them covered until ready to serve. Top with your favourite sauce and voila! 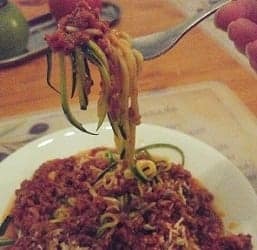 Spaghetti Zoodles Bolognese – without the carbs!